Open Educational Resources (OER) Commons is an open online library allowing you to search and discover OERs and other freely available instructional materials. The OER Commons infrastructure facilitates evaluation of content and its alignment to education quality standards. OER Commons works with the finest producers of instructional content in the world and gathers their best work together especially for you. Register, log in and discover OER Commons curated Collections. Test search filters (e.g., Subject Area: Life Science – Career/Technical – All Conditions of Use – Education Standards – Resource Evaluation Criteria – Language, etc.) to identify, access and retrieve OER you could be interested in. OER teaching and learning resources can be freely used and reused at no cost, and without needing to ask permission. Unlike copyrighted resources, OER have been authored or created by an individual or organization that chooses to retain few, if any, ownership rights. OER often have a Creative Commons license or other permission to let you know how the material may be used, reused, adapted, and shared. contribute to and share OERs with other teachers and learners, at the forefront of a new educational era. 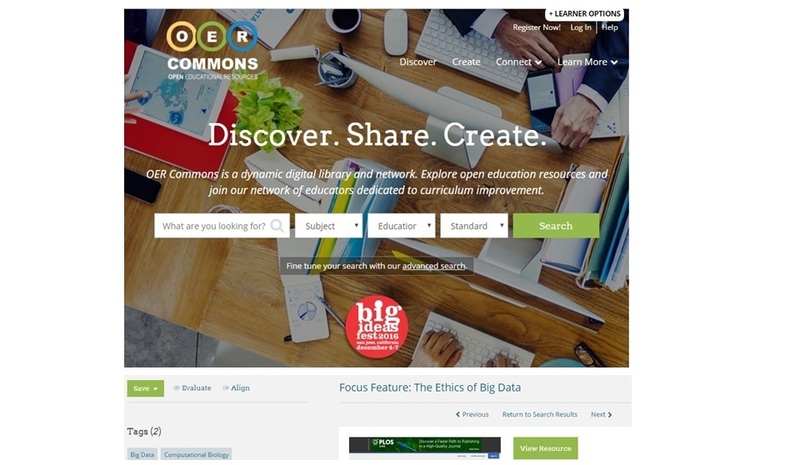 Moreover, OER Commons platform offers personalized OER Commons Hubs, Customized Microsites, and OER Training Programs. To learn how OER Team can help your organization leverage OER, contact OER’s services specialist: Mindy Boland (mindy@iskme.org). “Open educational resources (OER) are freely accessible, openly licensed documents and media that are useful for teaching, learning, and assessing as well as for research purposes. It is the leading trend in distance education/open and distance learning domain as a consequence of the openness movement” (Wikipedia). As a part of the 17 UN Sustainable Development Goals (SDGs), the global education agenda - Education 2030 Framework for Action, Target 3, point 43 states that: “A well-established, properly-regulated tertiary education system supported by technology, Open Educational Resources (OERs) and distance education modalities can increase access, equity, quality and relevance, and narrow the gap between what is taught at tertiary education institutions and what economies and societies demand” (International Council for Open and Distance Education). “Research suggests that moving from traditional books to OER reduces costs and improves student outcomes” (Impact of OER).